Looking for the Best Toddler Bed Rails? Parenting toddlers is a challenge, and there are reasons people deem them the “terrible twos.” They need your constant attention and are often all over the place. Toddlers are also prone to accidents. They happen most often because they fall out of regular beds. Toddlers either roll out of them or walk out of them unwittingly. Thankfully, such falls are preventable. 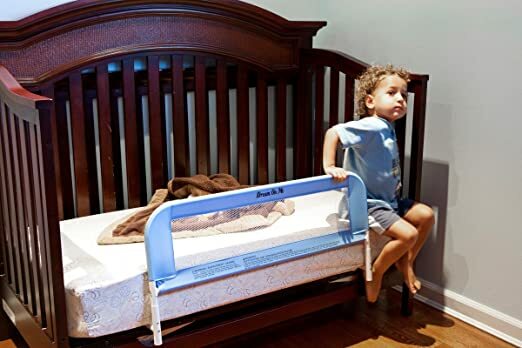 Bed rails help to rein in an active toddler. But how would you choose the right one? This review provides a comprehensive description of toddler beds and some useful advice. It also presents some of the best toddler bed rails that you can consider. You would have no fear of your baby falling out of his crib because it has barriers to prevent falls. Accidents, however, may start to happen once he starts to use a regular bed without bed rails. The advantage of a toddler bed is that your little one can climb in and out of it without any help. However, he may roll off its side. You may have to install bed rails. They come in different types and will allow both you and your toddler to get a good night’s rest. You may want to consider bed rails if your toddler suffers from uncomfortable health conditions. They will stop him from falling if his pain causes him to shift. There are many types of toddler bed rails. Take a look at how each kind works, and pick out one that suits you and your child. One of these is a swing down rail. All you have to do is lock it in position at night, and it forms a dependable protective barrier. You can fold it down during the day to allow him to move in and out of bed freely. They are the easiest type of bed rail to use. There are also crib rails, which are ordinarily not pleasing to the eye. However, many of them slide out of sight, allowing you to hide them whenever you have company. There are fixed rails, which look uncannily similar to toddler rails. But that is where the similarity ends. Unlike swing down rails, fixed rails cannot fold down. Much like speed humps, bumper rails sit under your toddler’s bed sheet. They stop him from rolling about and are easy to sent up. They are also portable and usable with any bed. Note, however, that they do take up space. A bed rail, while having a host of advantages, has its dangers as well. You would be wise to weigh its benefits and risks before installing one. Rails offer support for tiny tots as they get in and out of bed and will assure you that your toddler is safe. You can sleep without worry. However, they may entangle your toddler’s clothes and cause accidents. There is also a risk that your little one may become trapped in a mattress and hurt himself. He may also feel resentful about being trapped by a rail. When it comes to choosing a bed rail, your top priority should be safety. Ensure strict safety precautions, especially if your child is small sized. Do not choose one which may put him at risk of being stuck between the mattress and the rail. Think about how you will be using it. Are you choosing one that will help your child move from a crib to a regular bed, or for co-sleeping? Fixed rails will allow him to transition to a regular bed himself, while bumpers are suitable for toddlers who sleep with their parents. They will prevent him from rolling over. A rail provides a cozy environment, and prevent your toddler from being traumatized by a big bed. When choosing one, notice how it joins with the bed. The material should slip under the mattress to stop it from collapsing. Note that there should be no gap between the mattress and the rail. Now that you have fitted your bed rail, how would you best use it, and get value for your money? These suggestions may help. Always measure your bed and mattress. Perhaps you need one that is longer or a taller one that exceeds the height of your pillow. Consider the material. Bed rails comprise wooden slats, box springs or flat tops. If it does not fit your bed well, you may have to use zip ties. Below are some of the best bed rails for toddlers. Each of them has a rating of 4.5 on Amazon. 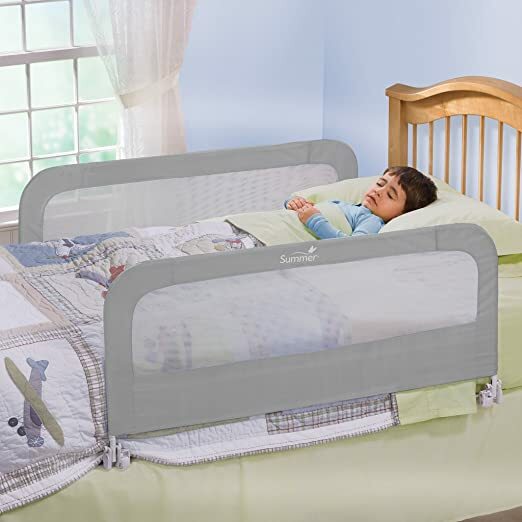 The Dream On Me Security Crib Rail is a mesh crib rail that will not cause your little one any pain if he bumps into it. He will not get caught between the mattress and the rail either. This light, 2-pound bed rail is easy to put away when you are not using it. 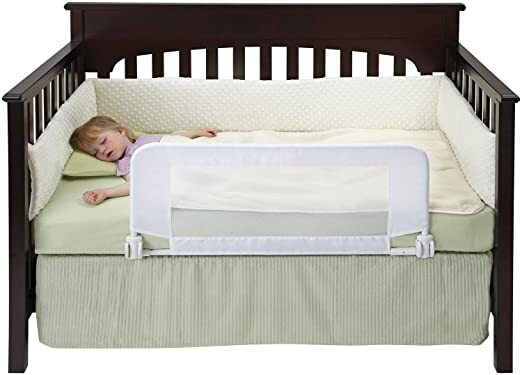 The Summer Infant Double Safety Bedrail is toddler bed rail is relatively high at 42.5 x 21 inches and will keep little ones from falling out. It is a full bed rail that can accommodate both twin and queen-sized mattresses. It will not be difficult to change linen because one side folds down easily. This bedrail is foolproof and meets safety standards. Installation is quick and straightforward. Its size makes it suitable for parents who co-sleep with their babies or have large beds. The Dexbaby Convertible-Crib Bed Rail for toddlers comes with reinforced anchor safety so that you and your little one will be able to sleep in peace. This feature makes it suitable for active children. It folds down completely for more space and is easy to put together. Durable, it will not fray or tear easily. It uses hardy materials, so you will not experience fraying or tearing. Dexbaby takes the risk of buying it upon itself and offers a lifetime guarantee. This rail is suitable for apartments or smaller homes. Pillowflex sells these bumper pads by piece, so you can buy as many as you need. Get one for just one side of the mattress or more to protect every part of it. It is easy to assemble and only requires placement on the mattresses. The semicircle structure keeps them from moving. 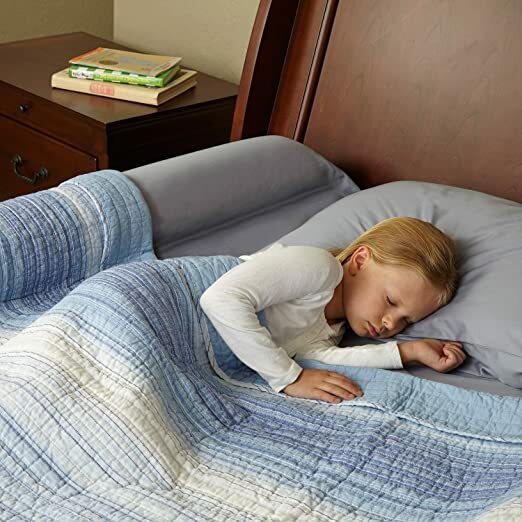 The firm foam will prevent your child from falling over but is still soft enough for him to sleep. These adjustable rails suit parents who want to customize their child’s sleeping space. Unlike safety rails, these bumpers do not cage in your little one. Made of polyurethane, they are safe and comfortable. It has a non-skid bottom, and will not slip off the bed easily. They are of a good height and suit most mattresses. All it takes to set them up is to slip them under the covers. They pass all safety standards for bed rails. They are suitable for most mattresses and co-sleeping because they define the boundary around the bed. Our choice for the top toddler bed rail is the Stay Put Big-Girl and Boy Bed. Its semicircle structure prevents it from falling off the bed easily. It is unlike other bumpers which may slip off your bed periodically. They fit under mattress covers comfortably, unlike other bumpers. Unlike fixed bed rails, you can buy as many of these as you need. Further, it is portable and allows you to tailor your child’s sleeping space according to his needs. There is also no danger of entrapment. Support is essential when choosing a bed rail, and the Stay Put Big-Girl and Boy Bed has a semicircle structure that provides stability. It offers the coziness parents look for in bed rails. The most important consideration when looking for a bed rail is that it fits. The Stay Put Big-Girl and Boy Bed goes under all mattress covers. Our choice for the top toddler bed rail is the Stay Put Big-Girl and Boy Bed. Its semicircle structure prevents it from falling off the bed easily. 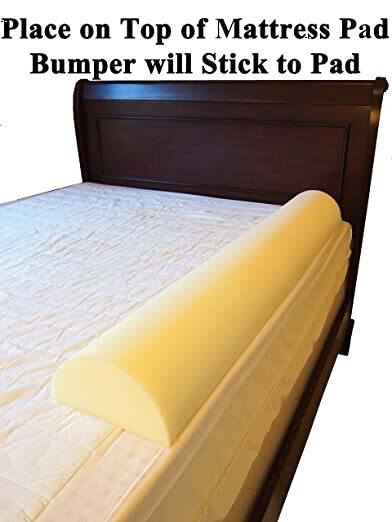 It is unlike other bumpers which may slip off your bed periodically. They fit under mattress covers comfortably, unlike the Toddler Bed Rail Bumper. Unlike the Dream On Me or Summer Infant bed rails, you can buy as many of these as you need. They are portable and allow you to tailor your child’s sleeping space according to his needs. Support is essential when choosing a bed rail, and the Stay Put Big-Girl and Boy Bed has a semicircle structure that provides stability. It also provides the coziness parents look for in bed rails.